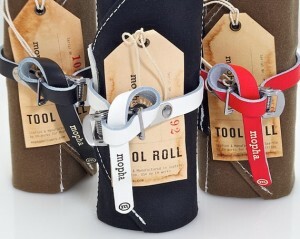 The Mopha Tool Wrap was first sent to me as a gift from Steve over at Hampsten Cycles. I’ve always struggled with finding efficient, yet cool-looking ways to carry tools. For a while I used a sawed-off water bottle, but this presented problems on days when two bottles were required. I then moved to a ziplock bag in my jersey pocket; but they were always too small or too big. Conventional saddle bags never seemed to hold the right amount of stuff–and if they did, they were too bulky for my tastes. You can get one yourself from the folks at E.H. Works, but I recommend buying one directly from Hampsten. And while you’re at it, pick-up one of Hampsten’s Gavia posters–they’re the perfect motivation for those days when you think it’s too cold outside to ride. Pros: Hand-made, durable, and stylish. And at $44, it’s a steal. Peeves: Some pumps are too long to fit the Mopha. My experiences might easily fit many cycling fans' definitions of “living the dream.” Since getting hooked on the sport watching Lance Armstrong win the 1993 U.S. Pro Championship, I've raced as an amateur on Belgian cobbles, traveled Europe to help build a European pro team, and piloted that team from Malaysia to Mont Ventoux. As a former assistant director sportif with Mercury-Viatel, I've also seen the less dreamy side of the sport – the side rife with broken contracts, infighting, and positive dope tests. These days, I live with my lovely wife in Pennsylvania and share my experiences and views on the sport at Bicycling Magazine, the Embrocation Cycling Journal, and at my own site, Pavé. 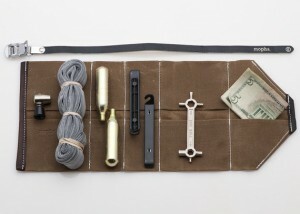 This entry was posted in Equipment, Featured, Musette and tagged 2011, hampsten, holiday gift guide, mopha tool wrap. Bookmark the permalink.